New small cell 5g mobile network towers will have to follow some design guidelines when they begin increasingly popping up around Manhattan. The City Commission unanimously approved aesthetic standards and a placement prioritization for the towers in public right of ways Tuesday. 5g networks will deliver users much higher rates of data to their devices with an incredibly speedy connection. The network is touted as being necessary for things like autonomous vehicles to function. 5g networks will require smaller towers to be spread around cities more frequently than current network generations, possibly every city block. There are currently 47 small cell towers around Manhattan. The FCC in 2018 issued a ruling that cities could not outright prohibit internet service companies from installing small cell facilities in public right of ways and had limited regulatory power over them. 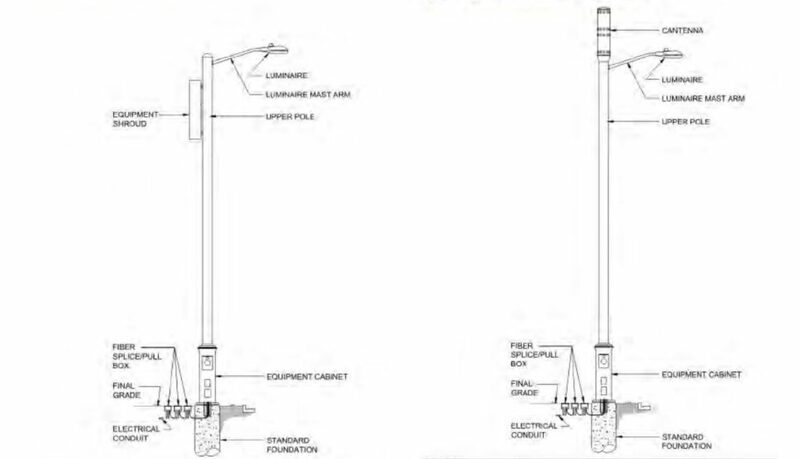 Regulations can’t force service providers to share a pole in a right of way, make them locate on a utility pole or make it so difficult that that they could not install their poles to provide their service. 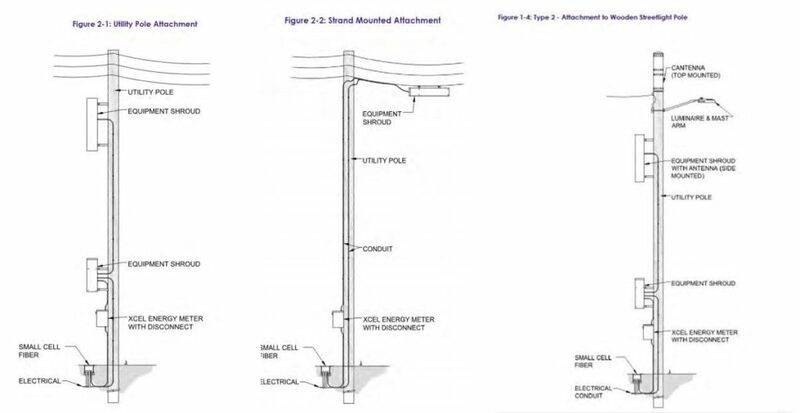 Cities can require service providers to follow design guidelines of the districts they are building in, including the routing of power underground where that is required. 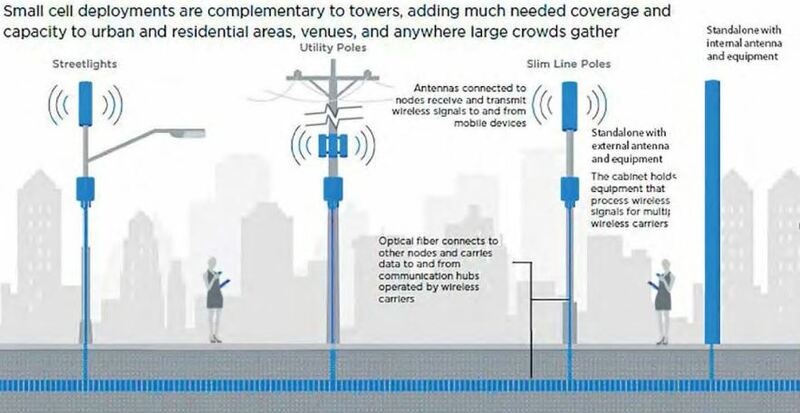 Manhattan’s ordinance creates a placement priority list for 5g equipment that could streamline the process for companies if they share a pole and prioritizes they be placed in alleyways. New poles in areas that do not allow wooden poles must be able to hold internal wiring, they cannot interfere with public infrastructure and must be painted a neutral, disguised tone among a few other regulations. Commissioner Linda Morse asked about whether they could place them on existing utility poles. Community Development Director Eric Cattell says that Westar would charge them a fee to do so. “It may end up being cheaper for them out on the street,” Cattell says. Commissioner Jerred McKee says not allowing cities to require companies to share a pole was short-sighted by the FCC. He described a future where every street corner is full of small cell towers because every company in the market has placed their own pole. Mayor Pro Tempore Usha Reddi says the new network is the future and she doesn’t think anything can be done about it. “Even though we may find it a burden or even intrusive in our property and kind of an eyesore,” Reddi says. She adds that the technology is still in its evolutionary stages and could continue to evolve. A bill has been proposed in the U.S. Congress to overturn the FCC ruling. The post Manhattan sets placement priority list for 5g small cell towers appeared first on News Radio KMAN.